For just $3.99 this bit of bling can be yours. It measures approximately 1″ long. Thanks to Terri O. for this find! Odd Scoots have their charms. 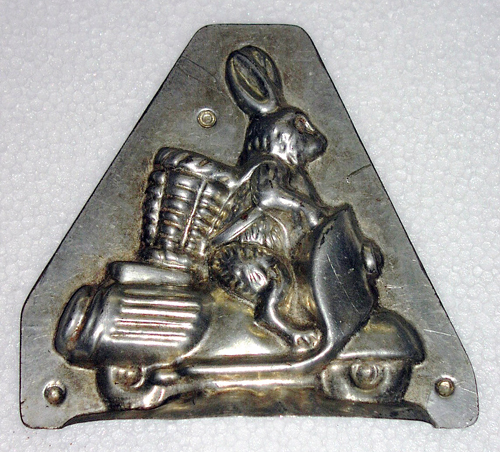 Here’s a Heinkel-ish, Fuji Rabbit-ish, something else-ish charm that is very detailed for $6.95. You can order it in pink or blue off of the Etsy site. Here’s a whole slew of beautiful vintage pedal and push scooters for some heavy duty ogling. Thanks to Nicole W. for this photo! 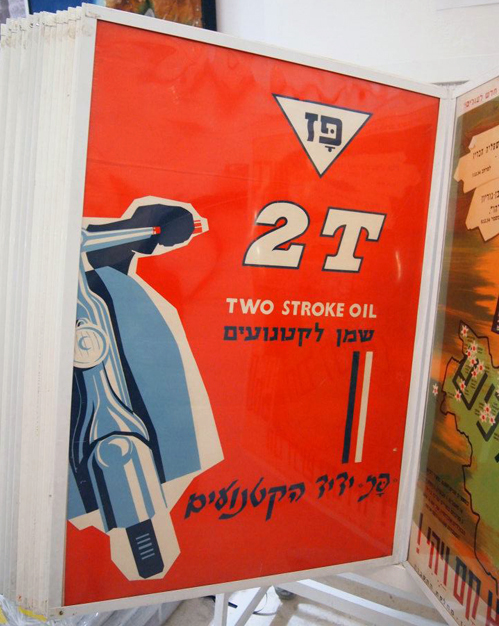 Taken at the Farakash Gallery in Old Jaffa Isreal. Here’s another Santa I spotted on eBay. Sadly I was outbid. And this is one I would quietly kill for. I mean, com’on! 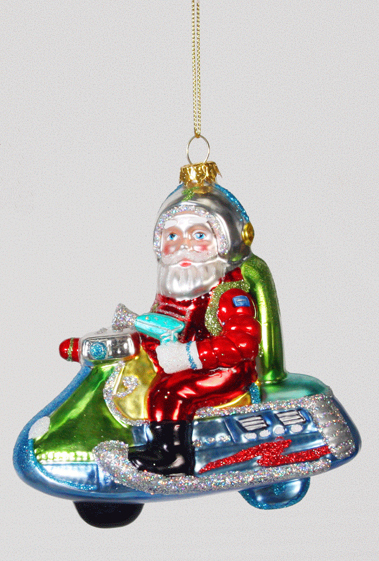 This is Space Santa! He’s riding a freakin’ space Heinkel! And he’s packing a ray gun! The good news is that this does not appear to be a vintage ornament. Hopefully more details to follow soon . . .
Oh how I would kill to get a hold of one of these great shirts. The keys to a scooterist’s heart. Tin toys and wind-up scooters are not only hard to find, but if they’re vintage they’re also fiercely expensive. But this time you’re in luck because all of these reproduction toys are on sale. 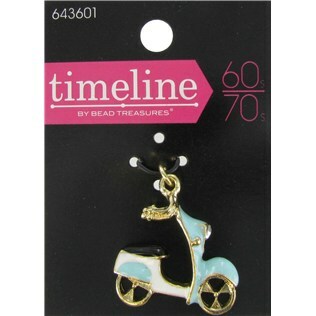 The scooter girl (measuring 7″ long) is just $21.98, the circus elephant is $47.98, the delivery scooter is $19.98 and the set of two Vespas is $9.98. 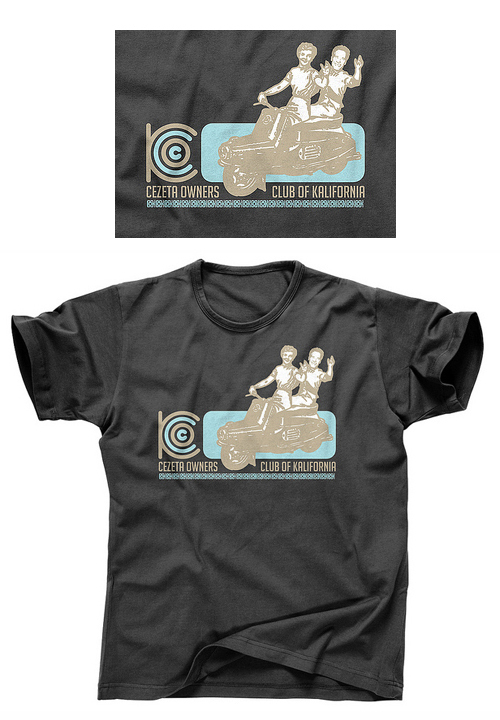 The perfect valentines for the hard-to-buy for scooterist! Thanks to Daniel S. for these great finds. 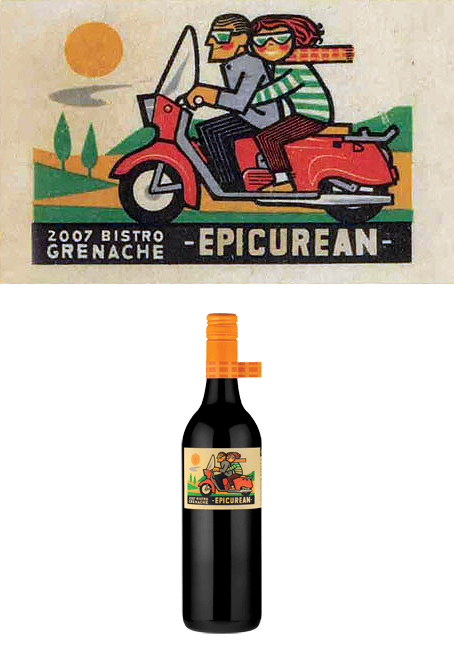 Wine maker Epicurean has released this 2007 Bistro Grenache. Note how the neck label mimics the scarf of the female rider – now that’s attention to detail! For those in the Portland, Oregon area, this wine is available in New Seasons Markets for around $13.99. For the rest of you, you can purchase it online for $12.99. If any of you do find this wine at a national or regional supermarket, please let us know, won’t ya? Thanks to Becky M. for this fantastic find! PS: I’ve heard reports that this is a Heinkel or a Zundapp Bella R204 but I think it’s more of a artistic license sort of scooter. If anyone has a photo of a scooter that most closely resembles this little guy, send it in at tips@scooterswag.com .